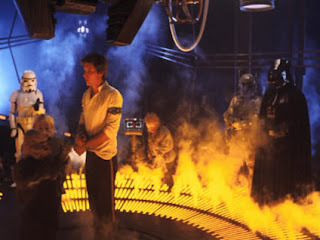 In an interview with "Vanity Fair", the director of Empire Strikes Back Irvin Kirshner was asked about the special effects, and talked about how hard it was to shoot the scene in the carbon freezing chamber. Turns out it wasn't cold, but little-people fainting hot. Q: What was tougher to shoot, Dagobah or the Carbon Freeze scene? A: The toughest shoot was the Carbon Freeze scene. The set was painted black. It was a round set but we couldn’t build the full circle because it would have been very hard to manipulate with the camera. So we built half of it, and it was a challenge because it was very hot and we were using lots of steam shooting out of the floor. Some of the little people fainted because they were closer to the steam. The staging was very difficult. The actors were about 30 feet off the ground and we had to be careful that they didn’t fall. Curse you, George Lucas. Putting them in hot fur suits and duck costumes was bad enough. Now boiling them with steam. What do you have against little people?! So it was hot instead of cold? Not fun.